A few years ago I bought Arts and Crafts for Lent, From Mardi Gras to Eastertide. It had some great ideas for getting into the spirit of the season with children. One craft that particularly caught my eye was the sand craft. 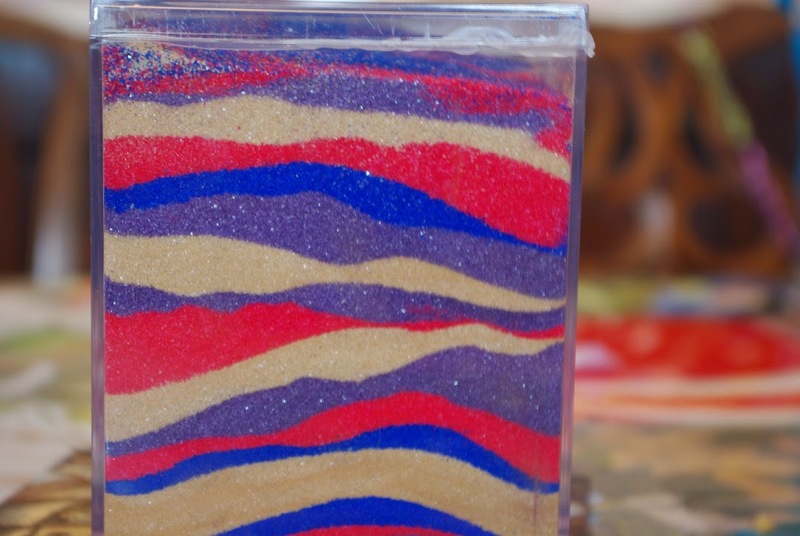 It basically only consists of colored sand and a bottle or container of some sort. I bought some inexpensive plastic bottles at the craft store and some colored sand. The Sand of course represents the dryness and the thirsting for Christ that we experience during Lent, also the wandering in the desert by the Israelites before reaching the promised land. Each color of sand has significance. The beige or brown sand represents the desert. Yellow for the transfiguration and light of revelation, blue for baptism and healing waters of life, green for healing and forgiveness, purple for Chris'ts kingship, red for Christ's passion and white for the lamb of God. Each bottle turned out a little bit differently as the children filled them. Those bottles held up pretty well over the years. One dropped and cracked, one is missing (I suspect one of the older boys might have taken one for their own home) and we have one left. So I thought it would be nice for my youngest to try the craft. There were no bottles at the local craft store and they were almost out of sand too! But I bought an acrylic container and we filled it with sand and the hot glued it shut. A pretty design for us to have in our Domestic Church table this lenten season!